Our first-ever Scholly Summit, held in Chicago, Illinois on February 10, 2018, ended with a BANG. 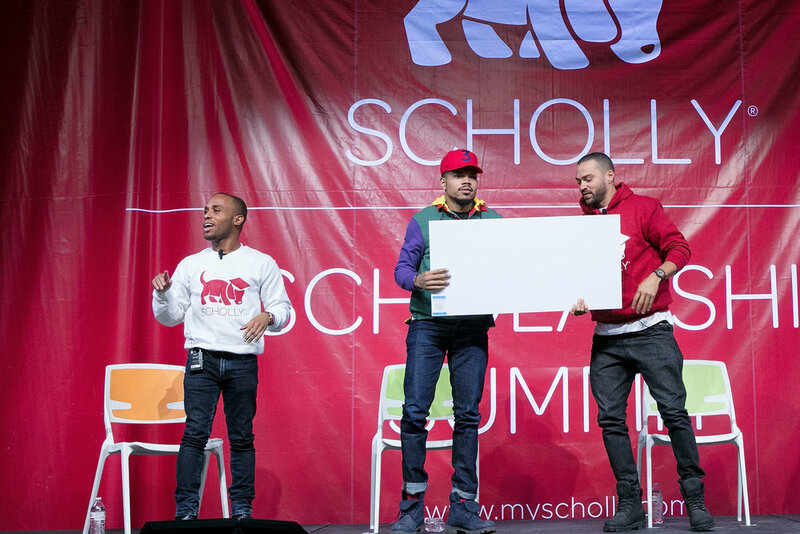 We had to opportunity to meet hundreds of Chicago Public School students, listen to words of wisdom from Chance The Rapper, Jesse Williams, and our very own Christopher Gray, and best of all, award one CPS Senior a scholarship! Meet Alexiea Feaster, winner of our $10,000 Scholly Summit Scholarship. Alexiea dreams to become a doctor and we are so proud to be able to contribute to her educational success! As part of her journey, Alexiea is this week’s Scholly Guest Blogger, sharing a bit about her background and her educational goals to inspire more students like her to chase their dreams, pursue higher education, and become a part of the Scholly Family. My name is Alexiea Feaster I am so honored to have received this scholarship! Currently, I am a senior at William J. Bogan High School in Chicago, Illinois with dreams of attending Xavier University of Louisiana in pursuit of becoming a Doctor...for free; and Scholly has brought me one step closer to this goal. I hope to one day save lives for those who are hurting and helpless, and Xavier’s pre-med program will best help me in achieving this dream. The Scholly app has been a tremendous help in matching me to scholarships that are the best fit for me and my goals, and the best part is that it saves time and eliminates the confusion students often feel while using online scholarship searches. On top of using the app, I had the opportunity to attend the Scholly Summit and it was an incredibly eye-opening experience that I feel fortunate to have attended. Of all the speakers we listened to, Derrius Quarles resonated with me the most. He is from Chicago, and is known as the “Million-Dollar Scholar.” He said something that I will never forget: “What you need to know now is that it’s bigger than you.”, meaning that life will bring us trauma, failure, and obstacles, but all of that is part of a much bigger picture of our success. We cannot get caught up in these micro-moments and let negativity bring us down. Most importantly, we need to accept help earlier on in order to make the journey to success an easier one and pass that knowledge on to others. When he said this, I felt inspired, motivated, and understood my purpose. I know that to achieve greatness I will have to think about the lives of others because how can an economy flourish if no one can pass knowledge on to the next person? Thank you, Scholly for granting me this scholarship and opportunity. You have opened the doors to success for me and I hope I can continue to make you proud! Congratulations Alexia! We can't wait to see all that you achieve. Want to win $10,000 like Alexia? Apply to our 'No Essay' $10k Summer Scholarship! Apply for 'no essay' Scholarship!